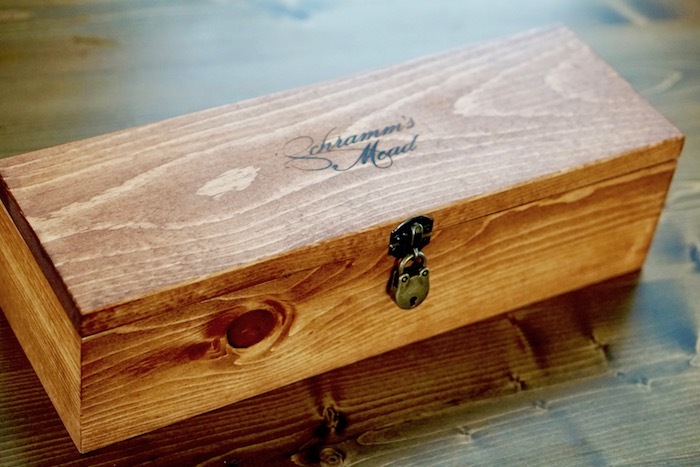 This signature Schramm's Mead wine box was made by hand in Ferndale, Michigan by our nextdoor neighbors at Long White Beard. 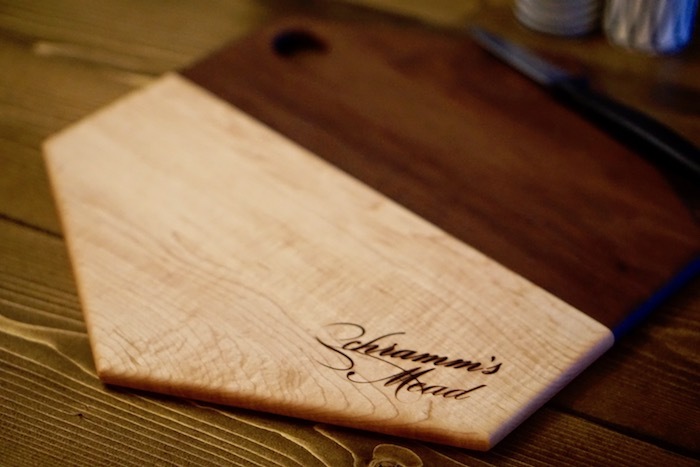 Each box includes a lock & key, features a unique wood grain and is put together with craft, care, and with an attention to detail which has made it a favorite with our local customers. These are solid, quality pieces, made to last for years and look good doing it. 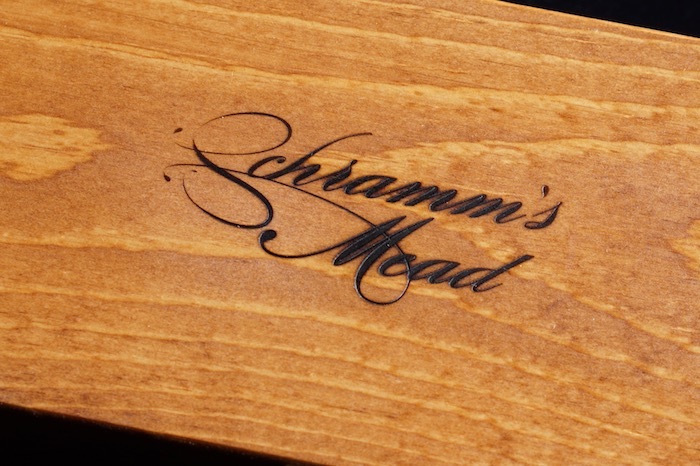 The "Schramm's Mead" logo is branded by hand. Depth and intensity will vary from piece to piece. Like great mead, a great love will deepen and mature with age. 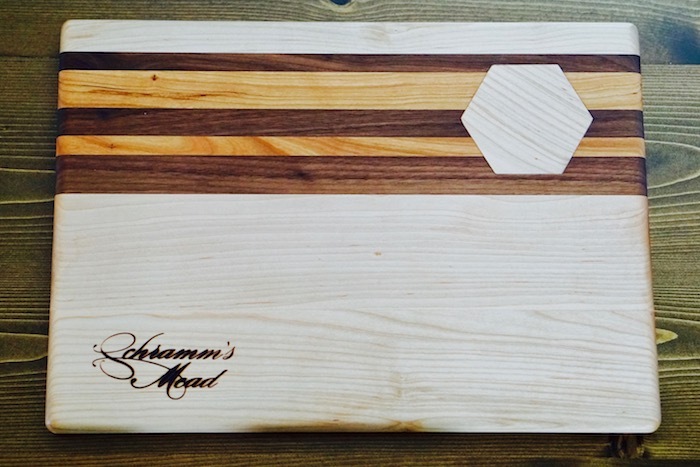 Put a bottle of mead in your handcrafted box with a love letter from one to each other. The concept behind a Wine Box Ceremony, during marriage, anniversary or vow renewal is that if ever a couple find their marriage or relationship has hit a rough spot, they will bring out the box, they will open it, share the mead, and read the letters reminding them of the love that brought them together and the promises they made to each other. It is the hope and belief of every relationship that the box will not be needed except in celebration of an anniversary–but if the box is needed, it’s there. Mead is one of the most suitable wedding gifts for a newly-married couple. Many believe the term “honeymoon” to have originated with mead, as newlyweds in some cultures were given enough honey wine to last for an entire month - one cycle of the moon. In the olden days the goal was to consumate the marriage and to begin a new family with this month of “sweet” love-making. Cheers!